Abyssische Tiefen ist das beste was man machen kann wenn man Obsidium braucht ... immer schön rum, und wenn du wieder vorne an kommst ist respawn da. Tiefenheim und Hyjal haben mich echt enttäuscht.. According to Nethaera obsidium is the new common mineral (think cobalt) in Cata and its nodes can drop gems, volatile fire, and volatile shadow. This probably will be prospectable in the future. Professions aren't finished yet. There are Obsidium Deposits in Mount Hyjal zone as well. Farmers trying to bury a useful comment? Don't let it happen! Fight back! RATE UP THE TRUTH! You will also come across the odd node in Deepholm. abyssal depths has a huge amount of them! This stuff seems INCREDIBLY rare compared to Elementium. I go to Deepholm and trip over Rich Elementium nodes, but getting enough Obsidium to get my skill high enough to mine them is grueling. This is insane. There's like.. No Obsidium compared to Elementium. All zones besides Hyjal and Vashj'ir has Elementium. Blizz needs to increase node rates for Obsidium, or place more of them in more zones. There has got to be something wrong with the Obsidium Node respawns. I spent all morning searching the Obsidium zones and managed enough ore to make 20 bars. Blizz needs to increase the nodes or decrease respawn time. I found a whooping two nodes in Mount Hyjal. Don't bother going there. It seems the best bet is underwater. Still no recorded nodes in Mount Hyjal? I just spent an hour tripping around there to find a (fairly small) amount of them for this pages' sake! I believe the heavy phasing in Mt Hyjal is hiding nodes from people, and causing the wowhead client to have issues recording the nodes you do see. Requires 475 mining skill to mine. 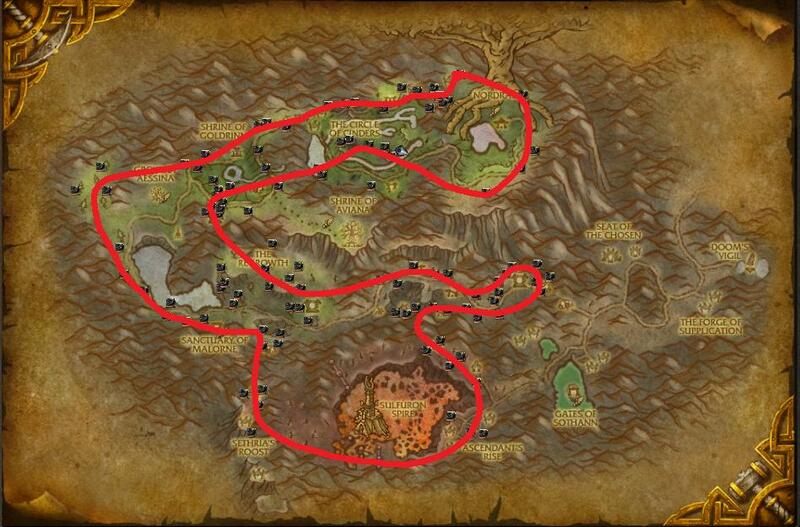 In Mount Hyjal after 2 days of farming Obsidium Deposit I was able to create a map such as this. Hope that it helps. Spent a couple of hours in hyjal looking for minerals and found only a few. Had much better luck in the shimmering expanse of vashj'ir. Mostly around silvertide hollow. Hope that helps and happy farming! Blizzard - phasing and nodes, do something about it please! Maybe it's because someone is cherry-picking the nodes, but this seems to spawn a LOT more frequently in Deepholm now. Flew around looking for elementium and have run into 6 nodes in about half an hour . . . anybody else seeing the same thing? I'm too lazy to quote the hotfix notes, but blizz raised the spawn rate of Obsidum in Deepholm yesterday. Merry Christmas. I feel the pain of everyone frustrated with the phasing nodes because I certainly have run into this myself. Mining last night I had excellent luck in Deepholm, which seems to suffer neither the frustration of phasing nodes nor the lack of availability that was previously plaguing the zone. It seems Blizzard’s made changes to both respawning and node diversity in this zone, making it a pretty solid place to go to get yourself down the road of mining, blacksmithing, jewelcrafting, engineering; whatever. Deepholm also has the rich version of this node, making it that much more efficient. I’ve encountered very little that is more frustrating than descending upon a node in Hyjal and starting to plink at it only to have the node disappear due to phasing. I have also successfully mined ore off some of the creatures there – Gorged Gyreworms and the "plain" Gyreworms as well, specifically. The ore itself is not listed on either of their loot tables and I am remiss in uploading my dataz. 24 ore in 20 minutes atm. Alright I guess.. Better than flying around finding two deposits each round in the rest of Hyjal. Mining Elementium regularly in Uldum and TH is still faster though. Have levelled mining from 450 to 525 on Obsidium nodes only in Mt Hyjal. Loads of nodes in SE area of zone after first phasing. I've had excellent spawn rates in Hyjal, at Darkwhisper Gorge. I can just fly a little bit and find another one. I often find spots where there are three nodes on my minimap at times. I can get a few stacks very quickly. I have had far, FAR better luck finding this in Hyjal than in Deepholm. What I found in Deepholm was primarily elementium. I feel like I found more nodes overall in Hyjal, also (i.e., less flying between mining). Does anyone know if there is a level requirement to mine cataclysm deposits? Or cant you just access the zones without the proper level? It disappeared due to someone mining it before you, not phasing - happens all the time. Would you really feel that much better to see them swoop down and start mining 2 seconds before you got there? To further "test" this area I went back out a couple hours after my 1st post and did 5 timed circuits, tracking all the info. Because I don't know how to make fancy charts and such here, I will just mention the totals and the range (lowest to highest) per circuit. If anyone is achieving results anywhere close to this in another zone, let us know. For the sake of completeness I also picked up 12 Volatile Earth, 1 Demonseye, 3 Alacite, 2 Zephyrite, 1 Nightstone and 1 Hessonite. It should be noted that while farming this ore you gain exp too. As a lvl 80 dk with jewelcrafting and a mining skill of 450 I gained 4400 exp per node. As a lvl 83 warrior with blacksmithing and a mining skill of 525 I gained 6050exp per node. I will post more data on exp gains once my dk is lvl 82, will also post data on my exp gains as an engiineer (not sure if this has any effect or not but hey its worth a mention) Also while mining this in mount hyjal I have received blue gems as well as the green gems, after mining up 1000 obsidium ore in mount hjal I recieved 2 demons eye, 1 ember topaz and 1 ember jewel. Not sure how to upload data, but I just found an Ocean Sapphire in an Obsidium Vein and noticed it wasn't on the loot list. In about 40 mins, I completely filled my first bag slot in the shimmering expanse near the quartermaster. Note that they've either cut the amount of Obsidium in Hyjal, or that with the Hyjal dailies, it's always gone in that area (after you reach level 85 and are phased with it). There are just no nodes in the Regrowth etc. for me, even at off hours. EDIT: So why was this downvoted? Just giving you guys a bit of advice about how Hyjal is not that good anymore. Oh, just realized it was probably bookworm13 who downrated this. For the best resource for determining mining levels as well as the best zones to farm them in, browse through the Mineral Veins listing. It's worth noting for you lvl75s out there that are trying to get a jump on Mining that if you mine in Hyjal and die... you're ghost will appear in Ashenvale.... 3500 meters from your body. Here's a good path that I found to be superb for mining Obsidium Ore with little to non competition. Each circuit roughly took twelve and a half minutes. I found a lot of obsidium ore around silver tide hollow at the shimmering expanses in vashj'ir. I didn't have a single issue with phasing nodes. generally, I'll run a /who Mount Hyjal, and a /who Deepholm, and farm obsidian in whichever zone has fewer people at the time. sadly I have been all over deephom now for 2 days and have turned up only 3 or 4 obsidium nodes but have found tons of rich elementium which sadly cant be mined yet due to not being high enough level. I ran into a similar issue with cobalt ore. my opinion is that mining like some zones is cross realm and you are not only competing against other miners on your own server but all the other servers as well. either way from my experiences over the past 3 days I gotta say that something is DEFINATLEY wrong currently in regards to leveling mining. Provides full Obsidiumerz at Mining skill 425. I see NO obsidian ore in Deepholm now! Help please? I need obsidium to level my engineer. It sure seems that Deepholm has been nerfed of obsidium deposits compared to the map wowhead shows. Is there some way to filter results by date range? For instance, I only want to see data uploaded within the last year. Dieses Objekt befindet sich in Tiefenheim (811), Hyjal (374), Abyssische Tiefen (128), Schimmernde Weiten (119) und Tang'tharwald (64).